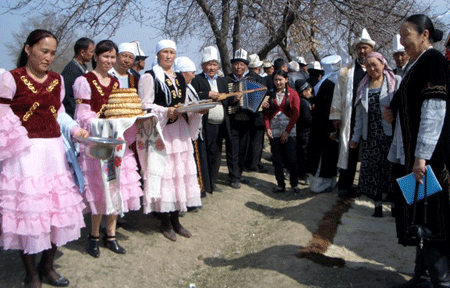 Alumni project improves faltering inter-ethnic relations between Kyrgyz and Uzbeks families in villages in south Kyrgyzstan by building capacity and educating women for the skills of leadership and tolerance. 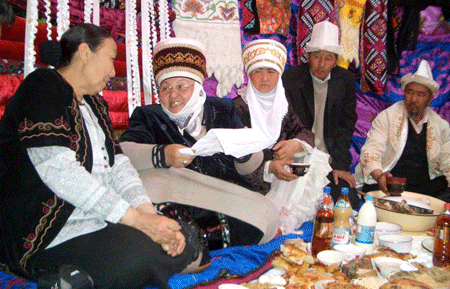 Participants in Legacy’s Kyrgyz Women’s Leadership Development and NGO Capacity – Building Program, were offered a $1000 grant to design and implement a community project with lasting impact on their communities. One of these women leaders, Zhumagul Bolponova and her organization, Too-moun aimdary, brought together hundreds in a tolerance building program. An initial group of 16 women in 4 villages were trained in leadership, tolerance, conflict resolution, and facilitation skills. These women then went on to train an additional 70 women. With the support of these women and other village leaders, Zhumagul’s organization brought together multiple ethnic groups in celebration. Recognizing that both ethnic groups shared the celebration of the Nurooz, the first day of Spring celebration, the women promoted joint participation in festivities. By emphasizing this shared value they were able to bring the two groups with a history of frictions together for the festivities in a mutually beneficial event. 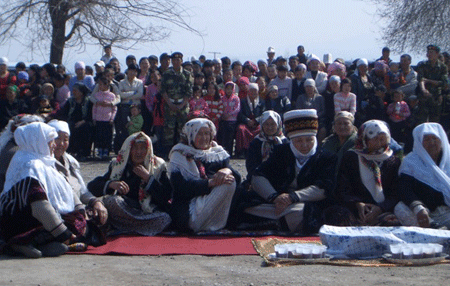 8 villages participated, presenting their community skills and specialties in food, dancing, music and crafts. Village teacher reads a poem praising Legacy participant Zhumagul's leadership. These activities offered a practical way to increase local and regional peace and stability by addressing the root causes of intolerance. By training trainers in tolerance and conflict resolution skills, they created multiplying effect across their region. And, by promoting the joint cooperation of activites around Nurooz festival, they offered a sustainable annual community event that will continue to bring together the peoples in the ethnically diverse villages. With some additional funds from Legacy, as well as independently raised funds, Zhumagul’s organization is now beginning a second round of trainings focusing on youth. Activities will improve of inter-ethnic interaction of the young people of frontier villages, involving them in building peace and involving them in the joint solution of the problems.